Well chums, I did promise I’d make at least one feather the last time I posted. I did! Since then I have settled into my mission to complete what is in my head for the group’s exhibition ( a word that still has me twitching slightly). To date, over 60 have been layered and stitched and I’m just watching as my pile of pleasing little things grow. I think some feel they look more like leaves, but that doesn’t really matter. It’s so nice sitting down in an evening and asking myself what sort of stitch each one needs. Sometimes it’s a lot, sometimes it’s hardly any. This piece is based around my mum, and some of the threads, fabrics and papers are hers, or reflect her talents as a dressmaker and lacemaker. 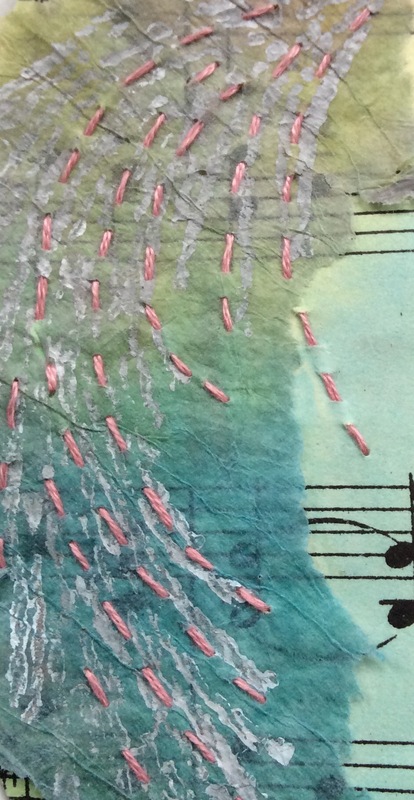 Music and Bible pages are also part of some feathers. I have learnt quite a bit about strengths of dye, how it dries, what threads are best and how different fabrics react. I wasn’t sure that my feather prints would show but I’m pleased with how I think they will be part of the overall whole but not dominate too much. I have also been able to share in a fundraising event at work for dementia research ( hence ‘fighting with feathers’). My work buddies and family and friends have ‘adopted’ a feather or two, and so I have raised some funds for this as I sew. It has sparked a lot of conversation needless to say, but is encouraging me along. I shall buy my canvas this week and have a play around with the figure and background that will support the feathers. 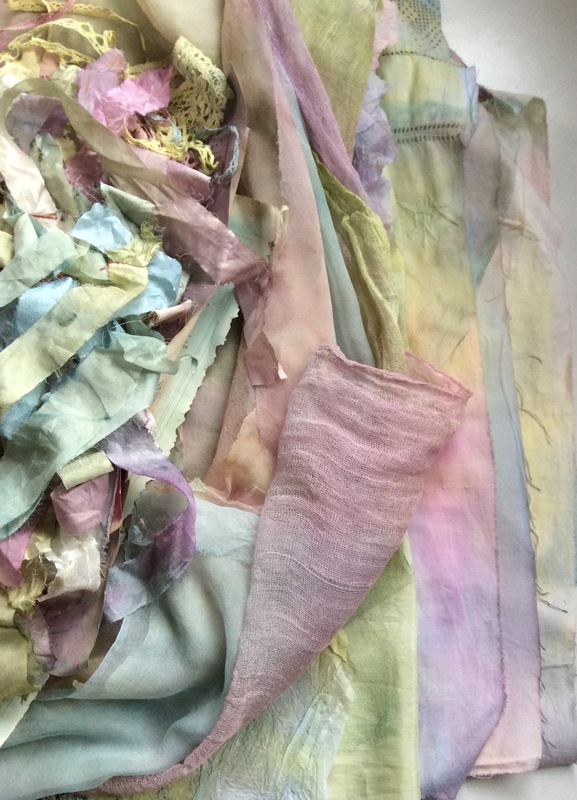 My most favourite thing in the world is combining fabric, paper and paint. This will let me know how small the first feathers need to be as I’m working on the middle-sized ones now….I think? Well it’s a bit dismal here today so I’m having a shed day. Him indoors is being very polite about the paper and fabric mess I’m making all over the place. 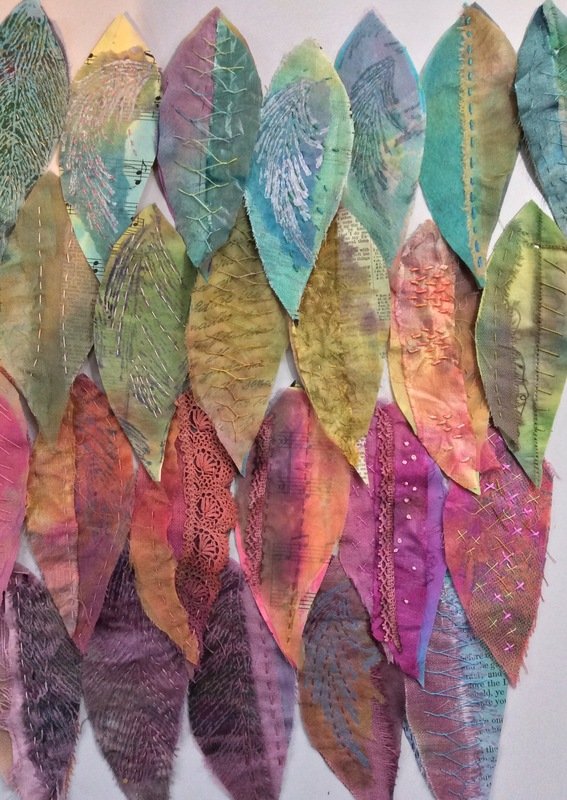 I can’t wait for next weekend with the Experimental Textiles group. I’m looking forward to our artistic chats of inspiration and seeing each other’s work. He’s probably looking forward to a tidy house and not having to manoeuvre clothes around trays of dye in the airing cupboard! !